Interline tickets are now available for purchase on Orbitz, Travelocity, and Expedia or by contacting your travel agent or by calling American Airlines reservations at 800-433-7300. Southern has also announced a new Interline Ticketing and Baggage Agreement with Condor for seemless low cost European travel. Now, with one ticket you can travel from the Morgantown Municipal Airport to Frankfurt, Germany and Explore Europe! Because your starting your Eurpoean vacation from the Morgantown Municipal Airport you’ll enjoy free parking and short TSA lines. Tickets are on sale now through your local travel agent or your favorite on-line travel booking site, like Expedia.com. Join us as pilots from around the area share their passion for flying and eagerness to help inspire the next generation of problem solvers by connecting young people to the wonders of science, technology, engineering and mathematics. Kids 8-17 get a free airplane ride! The event will be located inside the terminal building beside the rental car agencies. In case of questionable weather, contact the organizers via email to 842youngeagles@gmail.com. 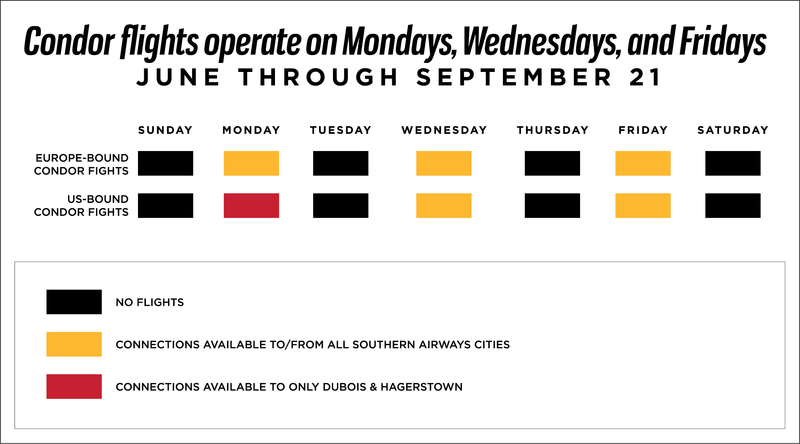 Southern Airways will be hosting a Morgantown Customer Appreciation Party on Sept. 20 from 5-7 p.m. at the Morgantown Municipal Airport. Come out and enjoy hors d’oeuvres, wine, and soft drinks, a craft beer tasting, live entertainment, and a chance to win two tickets from Morgantown to Miami and a two-night stay! Don’t miss this free event.